Parking facility on the controversial bus stand at McLeodganj has been withdrawn in the peak tourist season. According to sources, the parking facility has been withdrawn by the management of the bus stand after the power board severed its electricity connection. The commercial parking facility had been continuing since last year. The private management of the half-constructed bus stand had been charging Rs 30 per vehicle for parking. Waking up to the plight of tourists trapped in traffic jams on the Manali-Marhi-Rohtang stretch highlighted in these columns, the district administration has decided to close down Rohtang Pass for out-of-state vehicles from tomorrow and restricting the entry of trucks from 6 pm to 6 am. The Virbhadra-Kaul Singh war for supremacy in Himachal Congress politics today erupted into the open as senior Congress leaders from Mandi district came in support of Mandi MP and Union Minister Virbhadra Singh. Nalagarh MLA Hari Narayan Saini, who had died yesterday morning after a protracted illness, was cremated at his native Rajpura village with full state honours today. Chief Minister PK Dhumal and his Cabinet colleagues at the cremation of HN Saini at Rajpura village near Nalagarh on Saturday. There was an air of festivity and celebration at the house of Prashant Chauhan, who was released recently after being held hostage on board MV Suez. His family and relatives celebrated his safe return and also his birthday that was on June 5. Two employees of a food processing unit located at Marrawala came to light in Baddi today with a local hospital reporting the matter to the police. An 11-year-old boy died and 13 other tourists from Punjab were injured when their 18-seater Winger rolled down near Lower Sakho this evening. The injured were admitted to DRPGMC Hospital at Tanda, the police said. Lashing out at the UPA regime for burdening the common man, Chief Minister PK Dhumal today demanded a roll back of the steep hike in the prices of kerosene, diesel and LPG. Taking a serious note of the interference by politicians in administrative matters, the Himachal Pradesh High Court has stated that disciplinary action should be taken against government employees only if complaints against them made by public representatives are found to be correct. Taking a serious note of the bad condition of the Nahan-Paonta road, the HP High Court yesterday directed the superintending engineer (SE), National Highway Circle, HPPWD, and the Sirmaur Deputy Commissioner at Nahan and other duty holders to conduct a joint inspection of road conditions and take immediate action on the matter. People who have an income up to Rs 1 lakh annually, and women, irrespective of their income, can apply for free legal aid to the Legal Aid Services Authority at the subdivision or district-level and the entire expenditure of the legal procedures would be borne by the authority. Dharampur Congress workers, under its leader Chander Shekhar, gheraoed the police post at Dharampur today in protest against the arrest of Roshan Lal, former pradhan of Brang, who allegedly was being implicated at the behest of Transport Minister Mohinder Singh Thakur. With a capacity to accommodate over 100 private and commercial vehicles on one floor, the facility was a relief for tourists visiting McLeodganj and its adjoining station Bhagsunag. However, with the closure of parking, tourist spots have become more prone to traffic jams as no private hotel in McLeodganj has parking place. The entire pressure of parking has now been shifted to parking of Himachal Pradesh Tourism Corporation (HPTC) hotels, Hotel Bhagsu and the Club House. 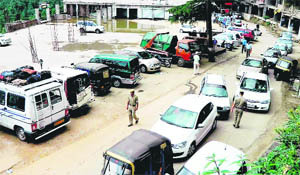 According to sources, the parking facility has been stopped after officials of the Himachal Pradesh Road Transport Corporation realised that the operations were being carried on in violation to the Supreme Court.orders. The SC in its order passed in 2007 had barred the promoters from carrying out any commercial activity on the site. The project was drawn into controversy after the promoters had allegedly started construction of the building on forest land without seeking permission from the Union Ministry for Environment and Forests. After some activists brought the matter to the notice of the HPRTC management, the power board swung into action and severed power connection to the project. None of the officials was ready to comment on the issue. Though hoteliers, taxi operators and travel agents have hailed the decision, Leh, Spiti and Keylong-bound tourists state that the decision is discriminatory. According to the tourists, they pay green tax, but are not allowed to visit the place of their choice. “It is the duty of the hoteliers and the Tourism Department to provide parking and make the stay hassle free,” commented Harish Shah, a tourist from Delhi. Kullu DC BM Nanta, after convening a meeting of the BRO, police and hoteliers, decided that only non-HP vehicles to the Rohtang Pass would be allowed to ply beyond Kothi to ease up traffic problem on the Gulaba-Marhi-Rohtang stretch. Nanta said the Leh or Keylong-bound private vehicles would have to take permits from SDM, Manali. “This will ease up traffic congestion and make tourists stay comfortable,” he added. A high-level police team under IG (Central Range) JR Thakur and SP Kullu Abhishek Dular today inspected the traffic regulation between Manali and Rohtang. The team found the condition of Marhi-Rohtang stretch in poor condition. Dular said about 60 policemen had been deployed to regulate traffic. “We have enough parking lots at the Rohtang Pass, Beas Nala and Marhi,” he claimed. Those joining the issue in favour of Virbhadra Singh included former Excise and Taxation Minister Rangila Ram Rao, Mandi Sadar MLA Anil Sharma, Balh MLA Parkash Chaudhary, former Nachan MLA Tek Chand Dogra, former Milkfed chairman Chet Ram, veteran Seraj leader Prof Virsingh Chauhan, Jogindernagar Congress leader Surinder Pal, Dharampur Congress leader Chander Shekhar and Mast Ram from Karsog. They jointly stated in a press statement here that Virbhadra was being made as a “centre of attack” by his detractors, who had an axe to grind, without naming any leaders. Referring to a statement by district president Puran Chand and media reports that pro-Virbhadra Singh faction would boycott party functions staged by Kaul Singh, they stated that these reports were targeting Virbhadra Singh. Virbhadra Singh, a five-time Chief Minister, had taken the state to a higher pedestal and his leadership was unquestionable in the party, they stated. Interestingly, Kaul Singh’s supporter Puran Chand openly warned former Forest Minister Ram Lal Thakur, a staunch Virbhadra supporter at a press conference here, against interfering in the affairs of Mandi district. The “war” between Virbhadra Singh and Kaul Singh erupted after the former had held the rally at Kanaid in Narchan against the PK Dhumal government where Ram Lal Thakur heaped praises on Virbhadra and stated that he was the only a mass leader in the state. After that there was the Dharampur episode last week where supporters of Kaul Singh, led by Nanak Chand, fought on stage with Chander Shekhar and other Virbhadra supporters. Their charge was that Kaul Singh was propping up his own team of supporters that had raised the ire of old Congressmen supporting Virbhadra. However, Kaul Singh said at a press conference held at Jogindernagar yesterday that nobody was above the party and disciplinary action would be taken against those indulging in anti-party activities. His body was brought here around 11 am from Panchkula and kept for some time at his parental home where thousands had gathered to pay their last respects. His body was taken to the cremation ground around 11:30 where his sons Gurvinder and Satpal lit the funeral pyre. His family members, including his wife Gurnam Kaur, two sons, a daughter, sisters and brothers, were inconsolable. Industries Minister Kishen Kapoor and Food and Civil Supplies Minister Ramesh Dhawala, who were his close associates, also broke down. Thousands of people from Doon and Nalagarh bade him a tearful adieu. Markets remained closed and offices wore a deserted look in Nalagarh. Roop Narayan, a close aide who had remained his political advisor, described him as a man of principles who never compromised on the agenda of development. The cremation was attended by Chief Minister PK Dhumal and Cabinet colleagues. The CM described Saini as a renowned social worker who was always concerned about the welfare and development of people of the state, especially of the Nalagarh area. Ravinder Singh Ravi, Irrigation and Public Health Minister, Kishan Kapoor, Industries Minister, Narender Bragta, Horticulture Minister, Ramesh Dhawala, Food and Civil Supplies Minister, Dr Rajeev Bindal, Health Minister, Sarveen Chaudhary, Social Justice and Empowerment Minister, Jai Ram Thakur, Rural Development and Panchayati Raj Minister, Mahender Singh Thakur, Transport Minister, Rikhi Ram Kaundal, Deputy Speaker, HP Vidhan Sabha, Satpal Satti, Virender Kanwar and Sukh Ram Chaudhary, Chief Parliamentary Secretaries, Virender Kashyap, Member of Parliament, Vinod Chandel, Dr Rajeev Saizal, Gobind Ram Sharma, Ram Lal Markandey and HN Kashyap, also paid floral tributes to the departed soul. 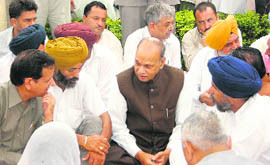 BJP vice-president Shanta Kumar had visited Saini’s family last evening and expressed condolence. Congress leaders, including former MLA Lajja Ram, Ram Kumar Chowdhary, Mukesh Agnihotri and Lakhwinder Rana, were present at the cremation. Prashant reached his house here in Comely Bank area at about 1.30 am and was accorded a warm welcome by his relatives, friends and neighbours, who had decorated the house and ordered a cake to celebrate his safe return. “It is because of the grace of the Almighty and good wishes of everyone that I am in my house, something which I could not have imagined a few days ago,” says Prashant, reminiscing the ordeal he suffered along with 22 other hostages for almost 11 months. Prashant weighed 64 kg when he had joined the ship. Now, he is lighter by 10 kg considering the stress and agony he suffered. Prashant, who had joined the ship MV Suez on May 20 last year as a chef, was held hostage on the ship after it was captured by Somalian pirates on August 2. “The pirates had practically no knowledge of English except words like “money” and “kill”, which they used to terrorise us,” he said, adding that on a few occasions even an interpreter was summoned to hold talks with them in English. Prashant says the hostages had taken their mobile phones, laptop and watches the moment they captured the ship. “Even on June 13 when an aircraft arrived with the ransom money of $2.10 million as per their demand, the pirates held on to their guns as the money was lowered with the help of a parachute,”’ he says. “To ensure that they were not being taken for a ride, the pirates counted the money with the help of counting machines and also ensured that the currency was real,” Prashant stated. The pirates allowed the hostages to speak very briefly with their families only once a month and that too urge them to urge their respective governments to arrange the ransom money. “I had been entrusted the task of managing food for all 22 with about 10 potatoes, some pasta and rice that was barely sufficient two persons,” he said. There were times when there was no food and they managed by surviving on fish they caught. Prashant says after resting for some time he wants to visit the Vaishno Devi shrine and his ancestral deity in Mandi district. “I want start life afresh,” he says on a positive note. Baddi SP Gurdev Chand Sharma said they were informed by doctors of a private hospital at Baddi that two youths, who were admitted there yesterday were suspected cases of food poisoning, had died. The two youths were Khem Chand and Kumer, both of whom hailed from Jammu and Kashmir. Since the youths were from the Nava Nagar area near Chandigarh, the police there had also been informed. It was learnt that 24 other employees of the same Unit Legacy Foods had also taken ill after consuming something and were referred to the PGI, Chandigarh, from a private hospital at Panchkula where they were take for preliminary treatment. The SP said they were looking into the case. Dr SB Sood, Medical Superintendent, DRPGMC, Tanda, said Harmanpreet, a tourist from Hoshiarpur, Punjab, was brought dead to the hospital. Thirteen others were admitted to the hospital. However, none of them was serious. The injured tourists included Kamlesh, 50, Ranjna Kumari, 30, Joginder Kaur, 53, Kamal Jeet, 36, Raman Jeet, 35, Sheer Singh, 42, Hari Ram, 62, Ramesh Lal, 52, Raj Rani, 10, Shanta, 27, Jagtar Singh, Kamlesh and Kamal. Kangra district police chief Diljeet Singh Thakur said the Winger had rolled 15 m down near the Kanchi curve. He said the driver was taken in custody. Kangra SDM Vinay Singh said the medical expenses would be reimbursed to the Tanda Medical College by his office. In a statement here today, he said the prices of practically all essential commodities had doubled during the past seven years of the UPA regime. “The common man who is already bearing the brunt of the unprecedented price hike has been the worst hit as it is increasingly getting difficult for him to make ends meet,” he said. Dhumal said the enormous Rs 50 hike in the price of LPG could push people in the hill state to rely of traditional fuel wood for cooking which would put a strain on the forest wealth. “Himachal has been hit the worst as the Centre has reduced our kerosene quota and at the same time enhanced the prices,” he lamented. The CPM also criticised the UPA regime for enhancing the prices at a time when international prices of crude oil had fallen to $ 90 per barrel. “The prices are being enhanced only to give a windfall profit to oil companies who are twisting facts to give an impression that they are suffering losses,” said Rakesh Singha, state Secretary of the CPM. “The CPM will launch a protest all over the state to demand withdrawal of the hike in prices,” he said. Justice Gupta further stated: “Transfer is not a punishment and if transfer is inflicted as a means of punishment, then the whole purpose of making transfers in public interest is set at naught. An employee who is inefficient at one station will not become efficient at another”. The court made these observations on a petition filed by one Pratap Chauhan alleging that he had been transferred at the behest of an MLA. He further alleged that the MLA had sent a note to the Minister for Rural Development in which it was stated that he - superintendent BDO Office (Chirgaon) - be transferred out of the constituency. The court further directed the SE to attend to the maintenance work on the Nahan-Paonta Sahib road and the Bata Bridge to the Yamuna Bridge and attend to the urgent works within three weeks and directed to file his affidavit explaining action taken in the matter. This was stated by Ranjit Singh Thakur, Civil Judge, Senior Division (Ghumarwin), and Chairman, Sub-divisional Level, Legal Aid Services Authority, while presiding over a workshop organised by the authority at Kot village here. Thakur said this provision had been made so that every citizen of India got justice as our Constitution guaranteed equal opportunities to all citizens. He said, “This free legal aid is also available to people belonging to the Scheduled Castes, Scheduled Tribes, backward classes, weaker sections, undertrial prisoners and other hapless persons”. He urged all representatives present in the workshop to spread this information in every nook and corner of their areas. As many as 150 gram panchayat representatives, including a large number of women, attended this workshop. Senior advocates Pawan Kumar Sharma and Chaman Lal also addressed the workshop.